Any idea what the update fixed? Changed 4bit pngs to 24bit pngs for DS4+ and corrected the obj file and cr2 file for the Minigun handheld. OK, thanks, got the update. 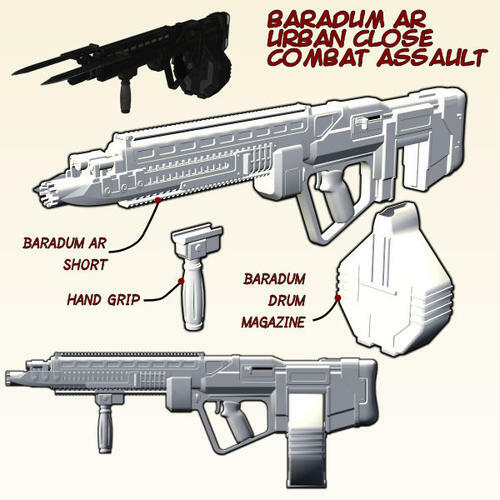 Really curious to see what folks are doing with our weapons... can someone please post a render? 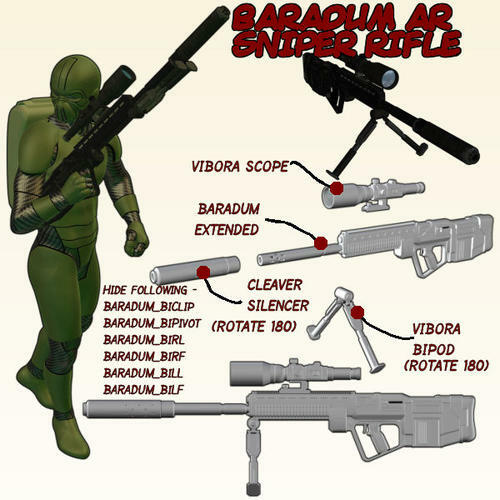 I am very interested on getting feedback about the design of our Baradum Assault Rifle weapons system. 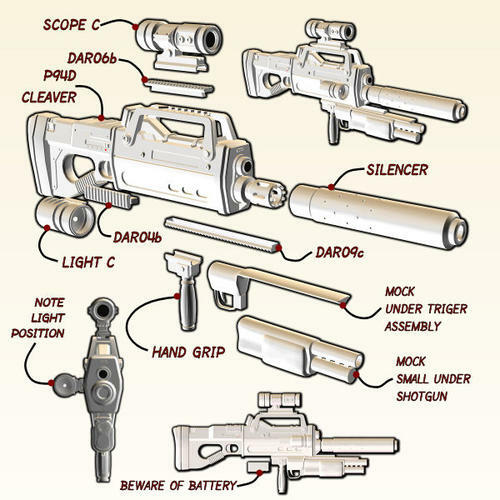 Specifically your thoughts and suggestions on what other DAR compatible accessories we should include in our next pack. Just to name some that come to mind. Lost the address and my account info for team dystopia's forums unfortunately...so I have been absent there a long time.
. . . 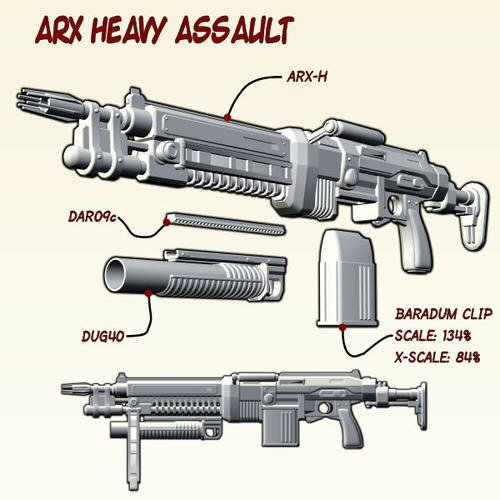 Specifically your thoughts and suggestions on what other DAR compatible accessories we should include in our next pack. Poses! For me that means Genesis poses, I'm sure there are plenty who'd like M4/V4 poses. Partial (hand/arm or upper-body) poses would be great, full poses would be fine too. I'm always under some kind of time-crunch, even when I'm rendering for fun. So when I need a weapon I'll usually go with one that has accompanying usage poses, even if there's a better one for my scene out there. 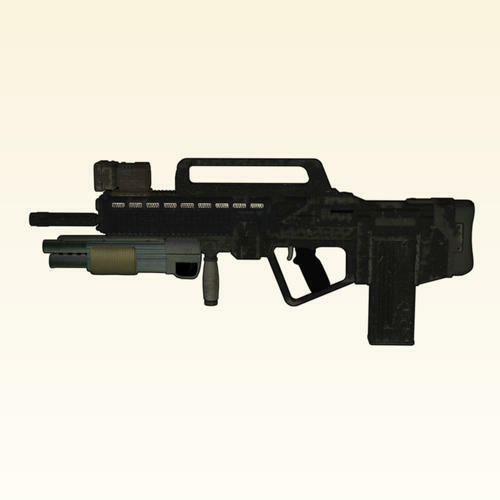 The render below is a perfect example -- there are several Dystopian weapons that would've been perfect for it, but I went with a rifle from M5 Firearms with Expressions and Poses because I could just load the prop, load a pose for it, adjust a bit, and move on to the next thing. Without that I could've easily spent an hour or more on it, and that's an hour I rarely have. Larger version in my deviantART gallery here. Here’s a couple of kit bashed pieces. Chainsaw... ??? I did not see that one coming. That's even more awesome than my dual bladed bayonets. 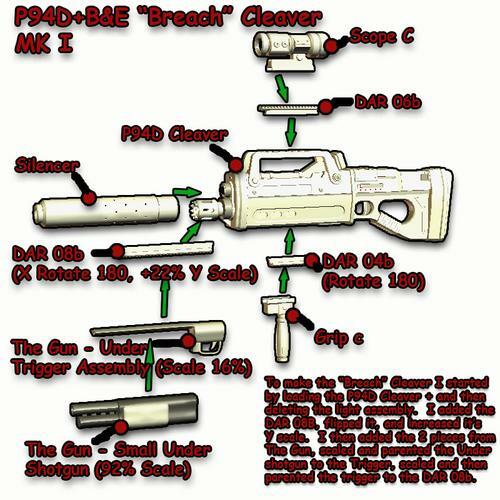 Yep... we've got the breaching shotgun (our "master key") on the list already. 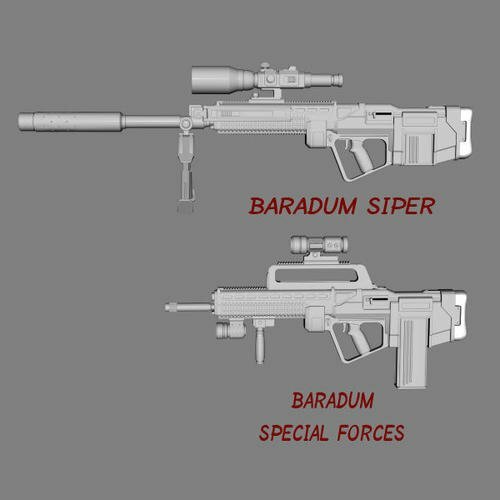 The grapple launcher and speargun would be similar on the service side, it would just be differentiated from the business end of things. Not sure how to deal with spooling cables though. The motion detector makes a lot of sense... definitely going to slap that on as a DAR accessory. Yes... I do have a flamethrower in the works, but I am not too thrilled about my design solution for the fuel canisters yet. Can't help with Genesis, sorry... Buuuuuttt...on the M4/V4/G2/Miscellaneous cool figures I like side of things...well, can't say too much yet. 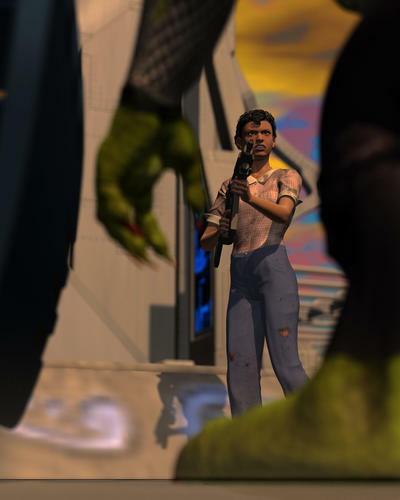 I should note the render below was just a quick render, banged out at low settings to test the Poses with some clothes (and the clothes are from mixed sets so what issues there are were not the poses). Aha! I see that most folks prefer the little light that original comes with the Cleaver rather than the floodlight that actually comes with the Baradum. Good to see that these pieces kit-bash well. Noted. I will really need to pass that request up to tyger_purr... I'm just the guy who puts the mesh together. All the real work, like mapping, texturing, rigging, posing, promos and packaging are all done by tyger_purr. I only get to do the fun stuff. I'll post a link to this in our forums as well so he doesn't miss it. Thank you for that valuable bit of feedback, KickAir. 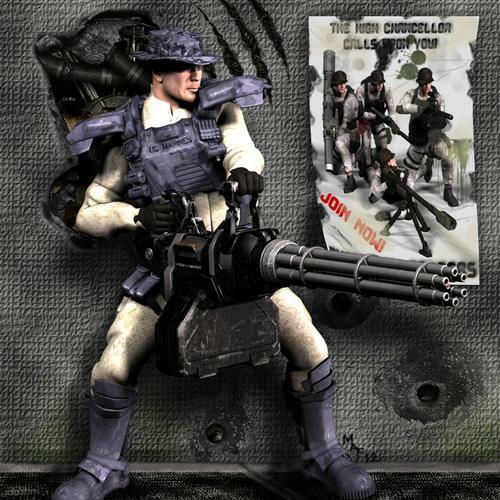 Love the recruitment poster... and those are pretty awesome poses... don't forget slashing and thrusting poses that could be used with the dual bayonets or even a (dare I say it)... a chainsaw! Did you get my message about access back into T-D? Thanks, glad to hear you like them, been working on them a while. I most certainly will have some poses for the bayonet, but haven't gotten to the second set yet (these ballooned from a planned 10-15 poses to about 40, plus hand poses and positioning poses to place the weapons right in hand, etc... M4 is almost done, and V4 will be soon to follow, then I will probably start on Poses for Cache set 2...when I get close to releasing I'll post more information and promos in the commercial forum, I don't want to hijack your thread). Yes, Thank you. Heading over there in a bit. 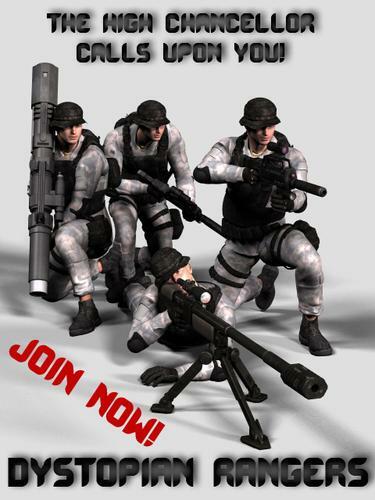 Also, anyone who wishes, feel free to download and use the recruitment poster as a texture in your renders (even though it is rough and low res - I'll make a better one soon). Just in case you've lost your way... you can find the Team-Dystopia forums here. Mocked up some kitbashes of the Cleaver using things from the runtime archives. You know those Spec Ops guys, their weapons are like their girlfriends, and they do some pretty wild things with them. My strengths are mapping, texturing and rigging. I know these things really need some poses, but I don't feel my stuff has been good enough. Got some poses up for m4, mentioned in commercial area. 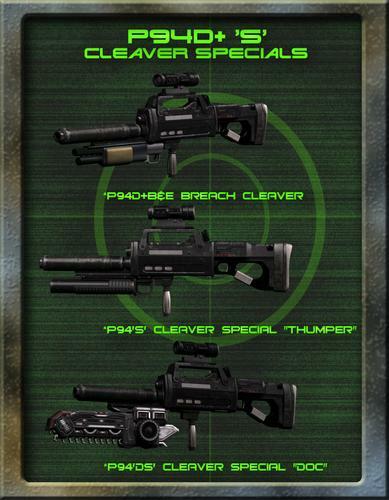 Here's some of what I have been using the weapons for. Very nice Greycat. Instructions even for others to follow. Always cool. 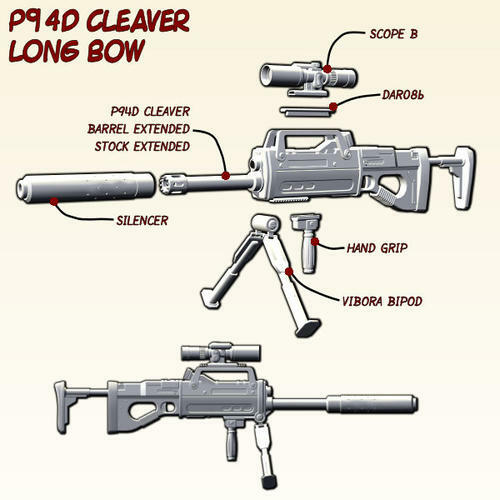 For those interested, I can provide some info on the Cleavers I made, but I use parts from Mock's various Gun sets, and the chainsaw was built with pieces from Davorama's GVCS/FVCS (and I wasn't really keeping notes on how I did that one). 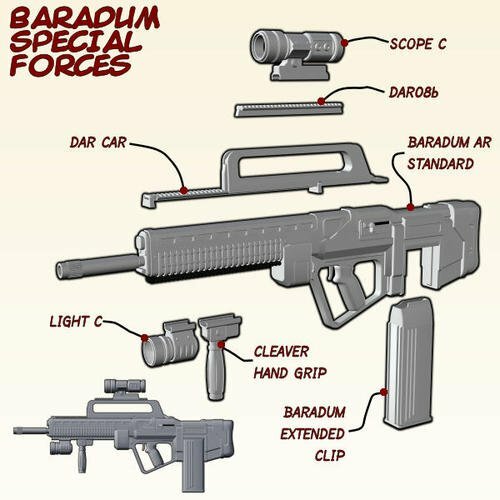 I also just recently realized the double bladed bayonet is built into the Baradum apparently - I was hoping to use it in some kitbashing too... oh well. Mock's gun is inexpensive, but the modeling simplistic and lacks detail. The power of kit-bashing unleashed!!! :lol: Bravo! Yup, that's basicly what I used, just couldn't remember which set it was from (long ago I edited my runtime and all 5 gun sets are in one props directory). I had to do some scaling, as for some odd reason the gun parts load at huge sizes. Also, I wish I had your patience in doing those nice instructional breakdowns. Unfortunately whenm I kitbash I often am not keeping track of exactly what I am doing, I just kind of go with the flow (look through my library manager and grab parts). To get the nice, clean, white look you use is that "Cartoon with Line" in Poser (or a comperable DS setting)? Sorry to try to emulate your "Build Instruction" style Greycat, just wanted to try to keep some consistancy for those downloading and using the images as instructions (yours still look cleaner). I brought The Gun by Mock, but I wasn’t very impressed by it and never brought any of the others. I converted them over to be used in D/S (daz files), I think at the time I adjusted their size for them to work properly. I’m not sure how I scaled them. In D/S I remove all the textures, set the Diffuse color to white, and Specular color to black which gives me a nice flat white. I’m not very good at lighting. I used different lighting in each render; I never could find one I liked. I render the image with a black background and save it as a tif file. I load the render into PSP and select using the alpha channel. I expand the selection by 2 pixels and feather it by 2 pixels. Then promote the selection to a layer. I turn off the background layer and now I black outline. I create a new layer above the background layer and flood fill it with a cream color graduate.